She only appears on the subscribers' issue, not the one sold in newstands. There are some things at the beginning like Emma's security team flew a day before her to the hotel to make sure it was safe for her and that in Toronto Emma's fans made it difficult for the security to keep Emma safe. Also, at the end of the photoshoot, Emma danced flamenco. They could be, but they are not boastful. They handle the success as someone who has earned it. She, charismatic and intelligent. He, warm and great. The British actress and the Spanish director premiere a film together. ¡Supernatural! Emma: Some days I feel that everything seems the result of faith and others I think my life is too surreal that I cannot believe it. Do you have to be a brave person to do a thriller film? Alejandro: I was an easily scared kid, but I loved watching thriller films. Maybe, putting myself behind the camera was a way to overcome my fears: to the death, to the darkness, to the devil. However, I would not say that regression is a horror film, if not a film about fear itself and how we get rid of it to have a better approach of situations and finally solve the problems. Emma: I have been offered darker roles before, but this was the first one I wanted to do. And, mainly, that decision was because of Alejandro, because to get into these very dark places and to really feel it you really need the help of someone you trust and someone you know will take care of you while you live that experience, that he will create an environment that will make you feel protected and safe while you do that work. In Regression, physiology faces spirituality. What side are you in? Do you believe in the afterlife, in the existence of God? Alejandro: When I filmed The Others, one of the actors told me that we was sure that I believed in ghost. And that’s not true. The truth is that I always try to be rational, even though I evaluate the possibility of something more, something that you can call spiritualism. And to make it clear I didn’t grow up with that kind of education. Emma: I don’t believe in ghost either, but I believe in the idea that the mystery, the unknown, to not be able to understand everything, is very important for the human consciousness. I think that is good to be curious because that allows us to turn on the inspiration. Moreover, there’s something shameful about the way people always approaches certain issues in a specific way: to be open to what might happen is something very beautiful. That doesn’t seem so simple for you. How do you deal with being a public figure and have a normal life at the same time? Emma: I have obliged myself to make a very conscious effort to achieve it because if I let myself be carried away by this industry, it wouldn't be easy to have my feet on the ground. To be famous in this job means being very isolated from the rest of the world: you spend many hours in cars, in hotel rooms… but is does not longer affect me. In the end, I've always found a way to connect with reality. For four years I only chose supporting roles and I have lived long periods of time where I have not only been involved in the film industry, but also, I went to college. And that helped me a lot. I think – and my mother saw that when I was very young -, If I want to be an actress I have to be able to portray people with different point of views. And only experiences bring you that ability. Both of you have become icons of causes that transcend your work. Alejandro gave the opening speech on the last day of the Gay Pride in Madrid where he mentioned the 10th anniversary of gay marriage in Spain. Emma is the UN’s goodwill ambassador with the HeForShe campaign for gender equality and the author of a speech that has made history. Are those roles the most difficult to perform because of the responsibility that they imply? Alejandro: I’m not a big fan of giving speeches. The things I have to say rather share them with my friends, my family… but there are times where you feel the need to do it. And, well, why not? Emma: Generally, I’m a very private person. And the day of the speech at the United Nations I was very nervous. But there are times that you feel that there are things you need to say. And, if you not said them, you know you’re not being honest with a part of yourself. That wasn’t something easy or natural. Even though I kept in mind that, if I dared, I would be more honest with myself and freer. I was scared, yes, but at the same time it turned out to be something very liberating. I thought that I would be honest and that in that way people could see who I really am. To show how you really are…In Regression underlies the feeling that the people that surrounds you –or even the ones that loves you- can become your worst enemies. Does that risk increases with the fame? Alejandro: I don’t feel it as something dangerous. I think that the possibility to meet a lot of people gives you the ability -o , at least I want to believe that I have it- to know who you can trust. The fact that there are people that approaches you with wrong intentions can happen whether you're famous or not. Emma: The only thing I know is, if that you’re famous, it happens to you on a broad scale, but the subjects and feelings are the same. Have you ever felt a victim of the Impostor Syndrome, that temporary psychological disorder that leads you to think that your success are not the result of your work but luck? 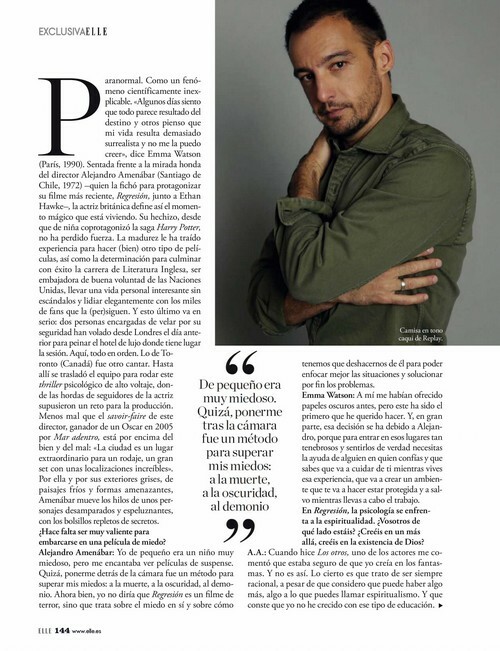 Alejandro: No, but insecurity is part of our job, particularly in the case of actors. Moreover, sometimes, the best results come from someone who is particularly insecure. Emma: It’s a very human feeling. It is often difficult to accept that your dreams have come true. And you ask yourself why that happens to you and it doesn’t happens to anyone else. Why you. It’s complicated: This are feelings hard to process but they made me more determined, they help me to work to be more worthy of the privileges that life has placed in my path. Emma, now that you have finished your English Literature degree, is it possible that you come up with your own script? Emma: (Sighs). That, with certainty, is something difficult to do, and I’m sure it would make me very vulnerable. Alejandro: In the film there’s a scene in the bathroom with Emma and Ethan that I keep in mind because it was the first one that we rehearsed together. I remember the first day on set the three of us sat together on the floor and started working. And then, Emma started to suggest things and then Ethan too, and for me it was the perfect collaboration, because the two of them rewrote the scene. It was beautiful. Those things happen. Life if full of surprises. Did you expected it to be treating you well? Alejandro: I, as a teenager, knew that I wanted to dedicate myself to this business somehow. Of course that when you’re younger you have dreams, very ambitious dreams. I knew that I wanted to be a director and nowadays I feel very lucky, because there are a lot of people that wants to work on something that is privilege for me. Yes, I usually pinch myself.